Good quality kilts for children are a substantial investment for any parent. That is why when you are considering buying a kilt for your son you need to know that you are buying a quality item, one that will last, and not some poor imitation of the real thing. It is becoming very fashionable these days not only for dads to be dressed in kilts , but their sons too. 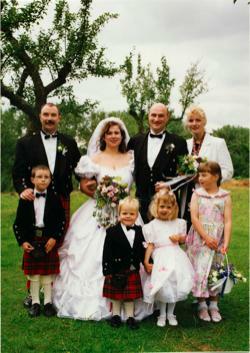 weddings for example, it is now not only the groom and male guests that are seen in Highland Dress, but children too. At my own wedding, please see the photo above, we had two little boys, one a nephew, the other the son of a friend, dressed in kilts. They both looked fantastic in their Highland Dress, and drew lots of admiring looks and comments from other guests and members of the public. Many parents do of course hire kilt outfits for their youngsters, when attending special events such as weddings etc, but having said that a lot of quality kilt makers now find themselves being asked to make kilts for children, rather than only hire them. Kilts for children are by no means a modern phenomenon, indeed parents have been dressing their children in kilts ever since Queen Victorian started doing it with her sons on a regular basis. The photo below was taken in New York, sometime between 1906 and 1914. 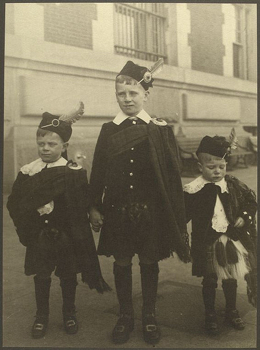 And I'm sure you will agree with me that the three boys look wonderful in their Highland Dress. These days children all over the world are are being dressed in kilts, in Japan for example, where they love all things Scottish, the kilt is worn as school uniform in many schools. And below you can see a photo of two young Japanese boys, who attend an international school in Kobe. 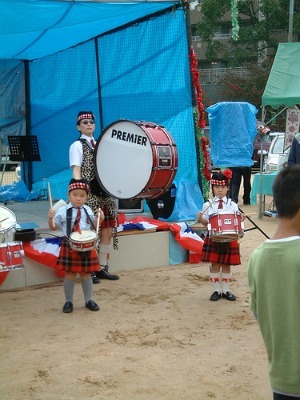 This photo was taken at an open day, and the children are happy to give a public performance of their drumming skills wearing their kilts. A child's kilt is made with the same attention to detail as a kilt made for an adult, it is a made to measure garment, and as such it should not be bought off the peg. There are one or two slight differences between a child's kilt and an adults. The first is that a child's kilt will often have a hem, which then allows the kilt to be lengthened as your child grows. And the second is that the kilt maker will often add three or four pleats, under the apron when making the kilt, also to allow for growth. These measures which would not be seen on an adult kilt are of course put in place to extend the life of your child's kilt, thus giving a somewhat expensive garment far greater value for money. Another advantage of having your son's kilt made, is being able to choose the tartan that you (or your son) want, as with an adult version the choice of tartans is huge, and you are bound to find one, either your family tartan or another that you both like. And once you've chosen his kilt then come all the accessories. So what else do you and your son need to complete his outfit? Sgian Dubh (as a parent you would have to decide if he is old enough for one). So after all that, you can see that a full Highland Dress outfit is not inexpensive. However if you want an outfit for your son, that sets him apart from all the other children in his class, then a kilt and all its accessories is hard to beat. And on a final note believe me he will be so proud to wear it, and you as parents will be so proud to see him wearing it, that you will soon forget the cost and enjoy the occasion.